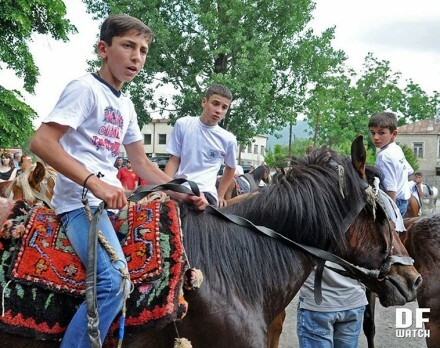 ALVANI, DFWatch–The last Sunday of May is a day of celebration in the Tush villages Kvemo Alvani and Zemo Alvani in Kakheti. Zezvaoba is the festival to honour the warrior Zezva Gaprindauli, who lead the Tush alongside the Georgian army against Persians at the Bakhtrioni battle in 1659. The main part of it is horse race, where Tush and Kists, a local minority group similar to Chechens, take part. Horse races are a common part of various village festivals across Georgia. However, Zezvaoba is different, as it is embedded in funeral traditions. The race (or doghi, in Georgian) begins in Zemo Alvani, with all the riders paying their respects to Zezva’s maternal uncle and his fellow riders, who died in Bakhtrioni by drinking horns of wine or beer to their honor and spilling the last drops of it onto their horses’ manes. Horses are also symbolically fed and a white ribbon is tied to each of them, to symbolise the blessing and also to help distinguish the participants from all the other riders around. After the ceremony, the riders slowly proceed to the start line in another village, Takhtis Bogiri, where the race starts. According to the legend, Zezva was promised as much lowland pasture land, as he could encircle galloping on his horse, Saghiri. He started right after the battle at Bakhtrioni and his horse finally died from exhaustion at Takhtis Bogiri, hence the race starts here. This year, the winner was a Kist teenager, the three other riders to cross the imaginary finish line in Kvemo Alvani town center were Kists as well. “Sadly, they always win. They are better with horses than we, Georgians, and this race is for them to show us that,” commented a Georgian man in the crow, when the race was over. The victory of Kists caused a small skirmish in the crowd. According to locals, it is pretty usual, and Zezvaoba is ironically called ‘Zhezhvaoba’, as ‘zhezhva’ means ‘to beat someone’ in Georgian. “One of the reasons Kists win is that they don’t tire their horses ahead of time. You see Georgian boys riding them back and forth before the race actually starts, and Kists slowly walk theirs towards the start line,” another spectator Khatuna explained. The race is only 3-4 kilometers long, but it is enough to run down the horses, as Zezva ran down Saghiri. For example, in 2007 a horse fell dead at the finish line due to overheat and exhaustion.